What Happens to Infants Whose Mothers Took Anti-TNF Agents During Pregnancy? Anti-tumor necrosis factor (TNF) agents can be detected in infants born to mothers with inflammatory bowel diseases (IBD) who took the drugs during pregnancy, researchers report in the July issue of Gastroenterology. Infliximab is cleared more slowly than adalimumab from infants. However, measureable levels in infants do not seem to be of significant clinical consequence, researchers say. Women of reproductive age with IBD face the challenge of being healthy enough to conceive and carry a successful pregnancy while protecting the fetus from the potential adverse effects of drugs needed to maintain remission. Active IBD increases risk of preterm birth and miscarriage. However, stopping effective medications for IBD can lead to a high risk of flare within a year, so this is not an option for patients contemplating pregnancy; guidelines recommend continuing therapy throughout most of the pregnancy. Anti-TNF agents such as infliximab, adalimumab, and certolizumab are monoclonal antibodies that are transported across the placenta starting in the early second trimester; 80% of the transfer occurs in the third trimester. However, little is known about in utero exposure to and postnatal clearance of anti-TNF agents in neonates. Mette Julsgaard et al investigated the concentrations of these drugs in newborns and rates of clearance after birth, and how these correlated with drug concentrations in mothers at birth and risk of infection during the first year of life. They performed a prospective study of 31 pregnant women with IBD receiving infliximab (n = 11), adalimumab (n = 10), or certolizumab (n = 10). Serum concentrations of the drugs were measured at birth in the mother, infant, and in cord blood, and then each month in the infant until the drugs were undetectable. Overall, 38 women (48%) had a disease relapse in the first, second, or third trimester of pregnancy, whereas 42 women (52%) stayed in complete remission throughout pregnancy. The authors found no significant difference in the number of disease flares in women who stopped anti-TNF therapy before or after gestational week 30. There were low rates of preterm delivery, small for gestational age, low birth weight, and congenital malformation. 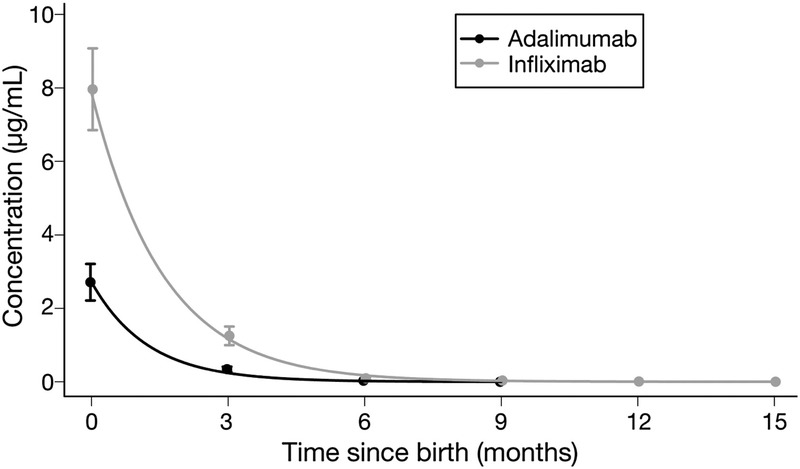 The time from last exposure to anti-TNF agent during pregnancy correlated inversely with the concentration of the drugs in the umbilical cord (adalimumab: r = –0.64, infliximab: r = –0.77) and in mothers at time of birth (adalimumab, r = –0.80; infliximab, r = –0.80). The median ratio of infant:mother drug concentration at birth was 1.21 for adalimumab and 1.97 for infliximab. The mean time of drug clearance was 4 months for adalimumab with no detectable levels by 9 months of age. Infliximab persisted longer, with mean drug clearance of 7.3 months; 1 patient still had a detectable level (0.03 μg/mL) at 12 months of age. Julsgaard et al found no correlation with anti-TNF concentration at birth and risk of infection in the first 12 months after birth. There was also no association between infants exposed to a biologic drug as a single agent or combination therapy and reaching developmental milestones in the first year of life. Bacterial infections developed in 4 infants (5%) and viral infections developed in 16 (20%), but none had serious outcomes. The risk for infection was 2.7-fold higher in infants whose mothers received the combination of an anti-TNF agent and thiopurine than in infants whose mothers received anti-TNF monotherapy. There was no association between drug half-lives and infant birth weight, cord blood concentration, or whether infants were being breastfed. The authors conclude that live vaccines should be avoided for up to 1 year unless drug clearance is documented, and pregnant women should be educated on the risks of anti-TNF use. In an editorial that accompanies the article, Priya Kathpalia et al point out that this was a small study with a wide confidence interval. Additionally, it comprised patients with disease in sustained remission who can likely stop their IBD medications with a low risk of flare over a year, and certainly over the course of a pregnancy. The findings do not take into account flare rates after pregnancy, the ability to restart and respond to the same class of therapy, or attenuated response upon restarting therapy. Kathpalia et al explain that nearly one-fourth of infants exposed to adalimumab had undetectable drug concentrations at time of birth, with the last dose having been received at a median of gestational week 32, although all infliximab-exposed infants had detectable levels in cord blood at birth (0.1–28.7 μg/mL). Kathpalia et al explain that the current recommendation is to wait 6 months before giving any live vaccines to these neonates with any in utero exposure, based on previously published data. According to the Centers for Disease Control and Prevention and American Academy of Pediatrics guidelines, the live vaccines potentially applicable are rotavirus between 2 and 6 months of age and measles, mumps, and rubella and varicella (chicken pox), each given between 12 and 15 months. Based on the findings from this study, the only vaccine that should potentially be avoided is rotavirus—all other vaccines can and should be given on schedule. More studies are needed to clarify the clearance of anti-TNF therapy in neonates exposed in utero and to determine what factors are associated with increased drug clearance. Kathpalia et al recommend individualizing treatment of pregnant patients to determine the optimal timing of anti-TNF cessation or dosing before delivery. They state that gastroenterologists must provide accurate preconception counseling to patients with IBD intending pregnancy, emphasizing that clinical, and even deep remission, for more than 3 to 6 months before conceiving is desired, even if medications are required to achieve this state. However, the sum of evidence seems to support continued use of anti-TNF therapy in pregnancy when clinically indicated and that the measureable levels in infants do not seem to be of significant clinical consequence. Do Nonselective Beta Blockers Increase Mortality in Patients With Cirrhosis and Ascites? Thank you for bringing attention to the important topic of treating Crohn’s disease and IBD in women of childbearing age. As you indicate, this is an area worthy of continued research to improve care for these women and their children. We wish to clarify one statement in your article that anti-TNF agents like CIMZIA (R) (certolizumab pegol) are transported across the placenta starting in the early second trimester. CIMZIA is not a full monoclonal antibody, but an Fab’ antibody fragment with no Fc portion. Active placental transfer of antibody molecules is thought to be mediated in part by the interaction of the Fc portion of the molecule with its receptor. CIMZIA has been shown to have low placental transfer in pregnant women. In fact, in an independent clinical study conducted in 10 pregnant women with Crohn’s disease treated with CIMZIA, certolizumab pegol concentrations were measured in maternal blood as well as in cord and infant blood (n=12) at the day of birth. The last dose of CIMZIA (400 mg for every mother) was given on average 19 days prior to delivery (range 5-42 days). Plasma certolizumab pegol concentrations were <0.41 –1.66 μg/mL in cord blood, <0.41 – 1.58 μg/mL in infant blood, and 1.87–59.57 μg/mL in maternal blood. Plasma certolizumab pegol concentrations were lower (by at least 75%) in the infants than in mothers, suggesting low placental transfer of certolizumab pegol. In one infant, the plasma certolizumab pegol concentration declined from 1.02 to 0.84 μg/mL over 4 weeks suggesting that CIMZIA may be eliminated at a slower rate in infants than adults. UCB has been leading the way in studying how biologic drugs impact women of childbearing age. Two key areas of focus are the transfer of a biologic drug through the placenta to the fetus and via the mother’s breast milk to the infant. Anti-TNF lactation data historically has been based on case reports without any controlled studies. UCB is the first company to conduct a controlled clinical trial to measure the presence of an anti-TNF in breastmilk and infants, with the goal of providing scientifically validated data for the medical community.